I'd realized that if I am going to be constantly just blogging about my experience at Salon Vim every time I pay them a visit, it might just bore you guys. Simply because I am not very adventurous with my hair and I doubt my mane will change over the next few years. I like to keep it healthy, clean and classy. Tons of times I've thought of dying it with streaks of candy colors but NO, I always end up going for my usuals. hahaha. I always feel great walking out of Salon Vim with new shiny, healthy looking hair. Anxiously waiting to get the nourishing serum and hold cream on! My hair actually feels softer right after the hair wash with the specialized water hold, moisture rich shampoo. Also, I must emphasize, they give you a really nice head massage during the hair wash process! I always feel like falling asleep cause it feels so good! Getting the hair serum and hold cream on. The Privy Caretrico Arimino Serum locks down my hair cuticles with moisture and nutrients. That's why your hair would feel exceptionally soft after the treatment! Getting my mane ready for some UV light action! The UV light speeds up the process and allows my hair to absorb more nutrients from the serum. And finally, I LOVE THE DRYING PROCESS! The stylists at Salon Vim never fail to give me really nice waves! Check it out! I've tried doing this myself at home but I'd failed. Instead of getting these pretty waves, a bunch of my hair got caught in my hair brush and I ended up pulling them out :( So leave it to the professionals please! As usual, Sham giving my hair one last final quality check. He really REALLY takes good care of my hair. Always asking me to give him permission to trim my ends even though I've stressed a thousand times that I want super long hair. HAHA. But I'd always give in anyway cause at the end of the day, Sham knows best and trust me, he can take better care of my hair then I can. Can't wait to be free again so that I can celebrate TGIF :( Can't believe I'm working at home now while everyone is out there partying and having a time of their lives. Anyway, its Ben&Jerry's Chunk Fest tmr! And I'm going!!! hehehehe. Hopefully the ice cream is good enough to make my weekend a little more enjoyable. p.s. Look out for my next post on Sunday. Comes with another vlog too! "VeritaJoy is an up and coming online boutique providing wardrobe solutions to all fashion forward shoppers around the globe. It is a site where all fashion lovers come together to shop, interact and be inspired! We believe that everyone is different and fashion is not limited to just one particular style or trend. At VeritaJoy, we offer a few ranges of stylish options to satisfy your different fashion needs. Our VQueen range offers premium and unique multi labels authentically manufactured in Korea. You can be assured of the quality and workmanship it offers and yet at a price much lower than any brick and mortar retail shop selling "Made in Korea" apparels. The best part - most pieces are wrinkle resistant and iron free! This is indeed good news to our busy cosmopolitan women. Our VChic range is normally very pocket friendly and the styles vary from trendy pieces to fun quirky casual wear suitable for both work and play. Our VVogue range comes in various sizes and cuttings which allow you to choose better- fitted apparels. This range offers boutique quality pieces with flattering cuts which are fashionable and inspired from run way trends. These structured pieces will definitely flaunt your feminine style and make many heads turn be it at work, on that special date or even at a party! It is our aim to provide all shoppers a truthful and joyful online shopping experience with us. With Our stringent check before shipping our products, you can be assured of the quality of the goods you purchased. In addition, you need not worry about buying the wrong item, items that will not fit or simply you have changed your mind because it is ok to return your purchase to us, no question ask. You can find more about us on http://www.youtube.com/watch?v=HPzLoA9DmNM"
Effortlessly chic! That's how you describe this super gorgeous outerwear! This item is from VQueen range which means that it was made in Korea itself! I can totally imagine a really pretty Korean lady wearing this. Being black and white, it'll go well with anything and it actually makes any boring tank look a lot more classy. 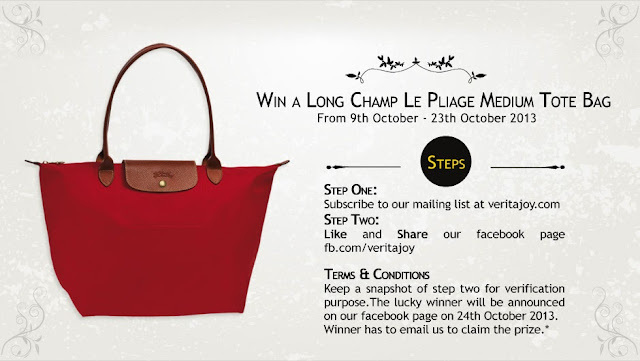 They are giving away a lovely Longchamp bag as their giveaway. Simply subscribed to their mailing list, Like and Share their facebook page from 9th-23rd Oct and you could stand a chance to win it! "Started in June 2013, we are an online blogshop based in the little red dot, Singapore, looking to provide girls with pretty trendy apparels at pocket-friendly prices. Our vision would be to in the future build up our variety of items and go on to sell other items such as accessories, shoes and bags that are equally important to every princess! Starting off small, we hope to one day be able to reach our dreams of opening a brick and mortar store in Sunny Singapore here itself! Although big, we believe that one day it will be reality." A white blazer is a MUST HAVE item for me. It goes well with anything and makes everything look a little more sophisticated and classy don't you think? I have a couple of white blazers already but this one stood out to me cause of its cropped hemline. It's also really soft and gives of a rather casual laid back appeal compared to corporate ones. So this would be a great TGIF outerwear in my opinion! So whata are you waiting for? Guess what? This is exactly what big companies are paying me for. They need to know what their average customer needs and wants. So large companies pay millions of dollars per month to the average person. In return, the average person, like myself, participates in surveys and gives them their opinion.